Our interns are starting a new webpage with a blog to share their experiences throughout the internship. Visit our new website at: https://umcpdieteticinternship.wordpress.com/. We hope you will visit our new site soon! As the internship comes to a close (I graduate on Friday – yay! ), I’ve found myself reflecting on all the things I have learned throughout this past year. Of course, I have learned more about nutrition than I could ever put down on paper: the ability to assess nutrition risk, educate and counsel patients, calculate EN/PPN/TPN formulas, and to write educational materials geared towards numerous different populations, to name a few. 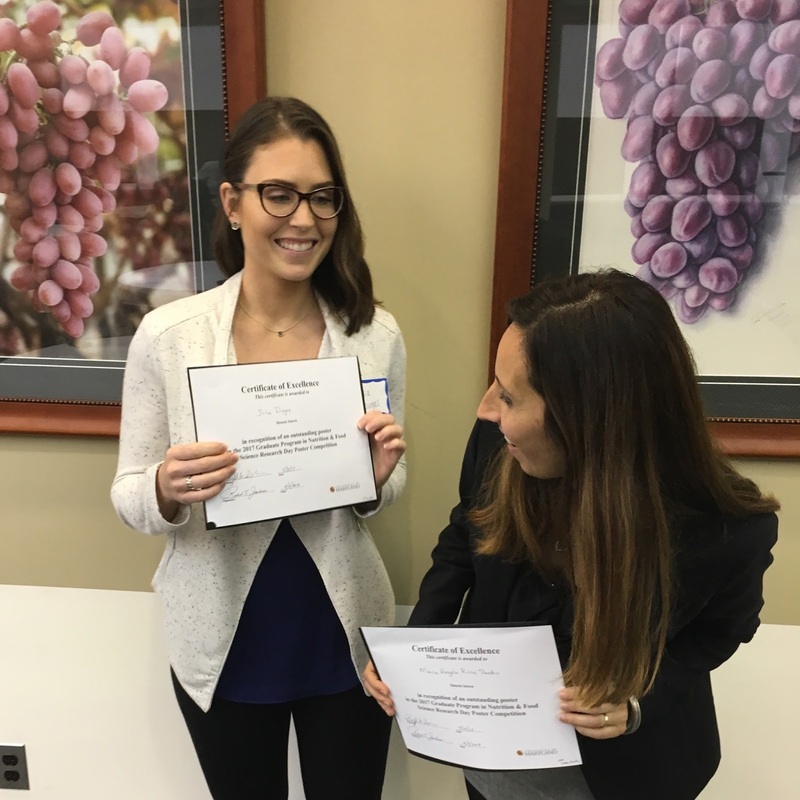 When I began the internship, I expected to strengthen my knowledge in the field of dietetics, but I did not anticipate gaining so many life skills throughout the process. If I had to choose one skill where I have seen the most personal growth throughout the year, I would say teamwork. Although I have always considered myself a “team player,” I previously felt most comfortable working on projects individually. I quickly learned that I would have to step outside of my comfort zone to be successful throughout the internship. At the beginning of the internship, each intern was assigned a partner. My partner, Ben, is extremely creative and clever, and I am organized and systematic. We quickly learned each other’s strengths and used them to our advantage. Together, we were stronger as a team than we would have been as individuals. Me and my partner, Ben. As a dietitian, this skill is essential in all workplaces, especially a clinical environment. I witnessed this firsthand during my pediatric oncology rotation. My preceptor and I attended rounds each day with the entire oncology team. Each team member was valued as an integral part of the team. My preceptor was in constant communication with the doctors, nurses, and social workers to determine the best nutritional care for the patient. For example, the nurse reported the intake and output and weight of their patients, which my preceptor used to determine the appropriate tube feeding for the individual. This one is huge. I have rotated through 14 different facilities this year. You know that awkward, nervous feeling you have when you start a new job? I had that feeling 14 times over the past 10 months! Each rotation and workplace is very different. Flexibility is key to making a good impression with the preceptors. During my rotation at the International Food and Information Council (IFIC), I was asked to switch between tasks often. On one occasion, my preceptor asked me to compile a list of universities that offer graduate degrees in nutrition. At the time I was in the middle of creating a blog post, but, after assessing the priorities of my projects, I was able to switch tasks quickly to assist with the more pressing project. Flexibility is a skill I know I will use in my career as a dietitian. I found this skill particularly useful at my long-term care rotation. My preceptor had various tasks to do each day. She had to attend numerous care plan meetings, screen and visit patients, and chart on them, including filling out the Long Term Care Minimum Data Set. The meetings were intermittent throughout the day, so my preceptor had to be able to make the best of her time between meetings to fulfill her other duties. Seeing this skill in practice opened my eyes to the importance of flexibility as a Registered Dietitian in all types of workplaces. You know what they say: “communication is key.” I have definitely found this to be true over the past year. Email has become my best friend. I now know how useful it is to have things in writing that I can refer back to. This helps ensure everyone is on the same page. Plus, email seems to be the communication method that most people prefer. I use email to clarify expectations for projects with my mentors, prepare for new rotations, and network with dietitians I’ve met at conferences and during rotations. Communication is extremely important when speaking to patients. I’ll be honest, I was pretty nervous when I initially started speaking to patients on my own. My interviewing skills were a little bit rocky at first. With time and practice, I learned the importance of tailoring my discussions with each patient to their specific needs. For example, some older patients were hard of hearing. I would make an effort to speak especially loudly and clearly to these patients. At my pediatric rotation, I used fun metaphors to explain nutrition so it was easy for the children to understand. Communicating with patients in a way they can understand enables them to comprehend their condition and dietary goals, a necessary first step to positive dietary changes. Me and my fellow interns on our last class day of the internship. Although, I like to think I have always been pretty good at these skills, I definitely have the internship to thank for helping me fine-tune them and apply them to a work environment. These skills will be invaluable as I start my career. Between the nutrition knowledge and life skills I have gained through the internship, I am confident in my ability to succeed in any workplace. Nutrition plays a key role in healing wounds, and during my long term care rotation at Villa Rosa Nursing and Rehabilitation Center, I spent a morning peeking over a wound nurse’s shoulder as she assessed patients’ wounds. Although my time shadowing the nurse was short, I was able to watch her change the dressing of three different wounds: a sacral pressure injury, a heel pressure injury, and a scrape. It was my first time seeing a pressure injury in real life! We reviewed medications pertinent to wound healing such as “calcium alginate” dressings, which create moist healing environments for wounds, and “santyl” ointment which works to remove dead skin surrounding a wound. I also learned that wounds heal best at normal body temperature. Of course, we didn’t forget to talk about the importance of good nutrition to promote wound healing! It is recommended that healthy adults get 0.8-1.0 grams of protein/kg/day, while the elderly get 1.0-1.2 grams of protein/kg/day. However, in patients who have wounds or pressure injuries, or are at risk for acquiring them, protein recommendations can go up to 1.5-2.0 grams/kg/day in order to make up for any protein lost in wound exudate and to help synthesize new skin tissue. In the long term care facility where I rotated, protein supplements were often ordered for patients who had inadequate nutrient intake, in order for them to reach their increased protein needs. This need for increased protein can also be accomplished through eating foods high in protein, such as meat or eggs. Getting enough vitamins and minerals can usually be accomplished through a balanced diet, however, a healing wound can often benefit from supplementation of certain vitamins and minerals. Specific nutrients that my preceptor at the long term care facility often recommended in patients with wounds were Zinc and Vitamin C. Zinc helps wounds because it plays a role in collagen and protein synthesis, cell proliferation, and immune function. It is important to note that Zinc supplementation should be recommended with caution because too much zinc can interrupt iron and copper absorption. Vitamin C is beneficial for collagen formation and its antioxidant functions. Sometimes patients have non-healing wounds due to elevated blood sugar, which is a concern in patients with uncontrolled diabetes. High blood sugar causes small blood vessels to become rigid, resulting in poor blood circulation. This prevents wounds from receiving the oxygen, nutrients and immune cells they need for skin repair. The healing process can take months due to this and can even lead to dangerous infections, which sometimes require amputations. Controlling blood sugar is an especially important task for anyone with diabetes and a wound. As a dietetic intern, it was a great opportunity to see several wounds first hand! I now have a better understanding how good nutrition promotes wound healing. With three weeks left of the dietetic internship you would think the stress levels have come down to an all-time low, right? WRONG. My next task is to take the CDR exam and secure my first job. I would be lying if I said that taking the first steps into the “real world” is not a bit scary. Luckily, I came across several resources that make finding and applying to jobs a little less stressful. Employment websites such as Indeed, LinkedIn, and Monster have become tremendously popular in the past few years. The concept is simple: businesses and organizations with openings post their listing to the websites; from there all it takes is a keyword search to find the perfect job. Employment sites are great because it allows anyone to easily see which companies are hiring. One of my favorite features is that you can create a list of jobs that you can access at any time, allowing you to apply immediately or at a later time. Since the listings are posted by the hiring business they are updated or taken down instantly and contain links leading to more information about the position and organization. I have taken advantage of an option which sends me email notifications about new openings related to my recent searches. I uploaded my resume to some of these sites where it will be reviewed by recruiters who may reach out with an opportunity. Employment sites are beginning to transition to phone apps, allowing the job search to continue from virtually anywhere. I personally take advantage of those few minutes before getting out of bed to scroll through job apps and see if there are any new postings. One of the mantras given to us at the beginning of this internship was “think of this as a 10.5 month job interview.” This set the tone for networking during rotations and inspired me to create my own personal connections. What many do not realize is how connected practicing dietitians are to other dietitians in the field. Assuming some connections have been maintained from their DPD and dietetic internship, a dietitian typically has is a minimum of 10-15 contacts. I have been fortunate enough to establish and maintain a connection with a dietitian I shadowed for some time during my undergrad career. She has not only been immensely helpful as a mentor, but has offered to aide me in my job search by contacting clinical nutrition managers in her network. Whether it’s serving as a preceptor for dietetic interns or reaching out to a contact about a potential job opportunity, dietitians are more than willing to lend a helping hand. Luckily for us, establishing these connections can be easy as we are introduced to many of them through the course of our rotations. One of the lesser known benefits of being a member of the largest professional organizations for dietitians, the Academy of Nutrition and Dietetics, is having access to their career resources. These resources include job boards similar to the employment websites, expert referral services aimed at those looking to start their own business, and a career development guide for those interested in creating a 10-20 year plan. When you become a member of the Academy, you are required to select a state affiliation. Most state affiliations have their own websites with a job board and will host an annual meeting, which is the perfect place to network. In addition to helping me search for jobs, the Academy offers resume templates and online marketing tips to its members which I have used to the fullest extent. Finally, a good reason to pay a yearly recurring fee! A lot of people believe it’s impossible to meet their nutrient needs without consuming animal foods; while at VRG we discussed rich vegan and vegetarian sources of calcium, iron, B12, and protein. Did you know that dark green leafy vegetables, tofu made with calcium sulfate, calcium-fortified soy milk and orange juice are all rich sources of calcium? Or that dried beans and dark green leafy vegetables are good sources of iron, especially if you pair them with vitamin C, such as tomatoes or citrus foods? Check out these resources if you’re curious about nutrients in a vegan or vegetarian diets. As long as you are diligent about your nutrient consumption, it is possible to receive enough nutrients from vegan or vegetarian foods. To finish the afternoon, we all shared vegan dishes that were both colorful and delicious. A couple of interns made tabbouleh, while others made vegetarian salads and entrees. We finished the potluck with a large fresh fruit salad and carrots and tortilla chips with hummus and guacamole. It was extremely tasty! While a vegan lifestyle may not be for everyone, it is a good option for some. And even if you don’t want to eat vegetarian or vegan all the time, it’s great to switch up your diet to include more fruits, vegetables, legumes, and nuts. As a future Registered Dietitian, I may counsel clients who want to adopt a vegan diet or who are vegetarian or vegan and need dietary advice for a health condition. I look forward to working with them to tailor a diet to their needs. Both eye-opening and insightful, this visit to VRG showed me a different perspective, and I am grateful for the experience! What does planning and organizing a theme meal have to do with dietetics? That was the question I asked myself at the beginning of a 6 week food service rotation. But as my partner and I started the planning, I realized that I was using a lot of information I learned during undergrad classes--like recipe conversions and calculating staffing needs. I also realized that I was gaining a lot of information that will help me as a future dietitian. Dietitians can play vital roles in food service operations, even as a clinical or community dietitian. I learned a lot about patience, compromise, and trial-and-error from planning our theme meal. Those are valuable life lessons that I’m sure I’ll use throughout my career, even though they’re not specific to the field of dietetics. However, there are components of planning a theme meal that directly relate to being a Registered Dietitian (RD). The first step in planning our theme meal was building the menu. We had a basic menu pattern for our meal: two salads, three sides, three entrees, and two desserts. Next we needed to apply our Hawaiian theme and select items that were suitable for our patrons. This was easier said than done. After spending hours upon hours researching authentic Hawaiian recipes, we chose a few selections that we felt would both be nutritionally sound and appeal to the seniors who would eat the meal. Only half of those recipes ended up on our final menu, though. We eliminated one selection because that certain type of fish was difficult to prepare for mass production; another one was ruled out because a key ingredient would completely blow our budget. This process reminded me of an experience I had working with a patient who was just diagnosed with renal disease; I suggested a number of foods that fit for his health condition, but each was shot down for various reasons, most often a dislike of the food. The patient and I worked together to craft a meal plan that worked for him, just like my partner and I crafted a menu that fit for our theme meal. I was happy to get this menu building experience because dietitians should be well versed in building well-rounded menus which are suitable for their populations. To plan a successful meal, we needed to convert recipes for mass production, convert ingredients to different units for accurate ordering, and analyze the nutritional value of the recipes. Analyzing the nutritional value of a meal may seem like a no-brainer, but it’s essential for RDs to know how to calculate the nutritional value of a meal without using the crutch of an online tool. And let me tell you--this was a long and tedious task for someone who hasn’t taken a basic math class in 4 years. Now that I’ve had the experience of doing so, I feel competent to calculate a nutrient analysis by hand in the future. A huge component of planning our theme meal was making sure we stayed on budget. Our budget included food cost and decorations. Thankfully, our food service facility managed the staffing, although we did get to play with the puzzle that is building a schedule of employees with irregular availabilities. Budgeting is a skill that, frankly, everyone needs to perfect. As a future RD, I can foresee using budgeting skills in many areas of dietetics, especially in a management role. During our meal, we passed out short surveys to ask customers about their opinion of the meal. After the meal was complete, we collected all of the surveys and compiled the results. We used this data to determine the least and most popular menu items and offer suggestions to future interns planning a theme meal. Quality assurance is a practice that I believe is of utmost importance to being a dietitian. Conducting any kind of quality analysis, whether it be formal or informal, is vital to knowing what you’re doing well and how you can improve. My partner and I spent many long days working together to carefully prepare and plan for this 2.5 hour event. While the process was not as fun as I thought it would be, I did learn a lot. I am glad I had this opportunity to develop many skills that I will continue to use as a professional; some directly relate to dietetics and some relate to professionalism in general. Thankfully our Hawaiian theme meal was successful, and despite those stressful weeks leading up to the event, I would do it again in a heartbeat. 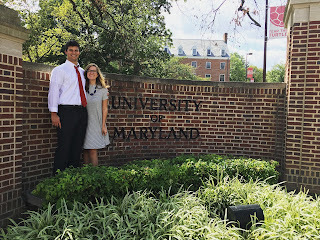 On Friday, May 5 the UMD dietetic interns had the opportunity to present abstract posters for the University of Maryland’s Department of Nutrition and Food Science Research Day, which was held at the National Agricultural Library. 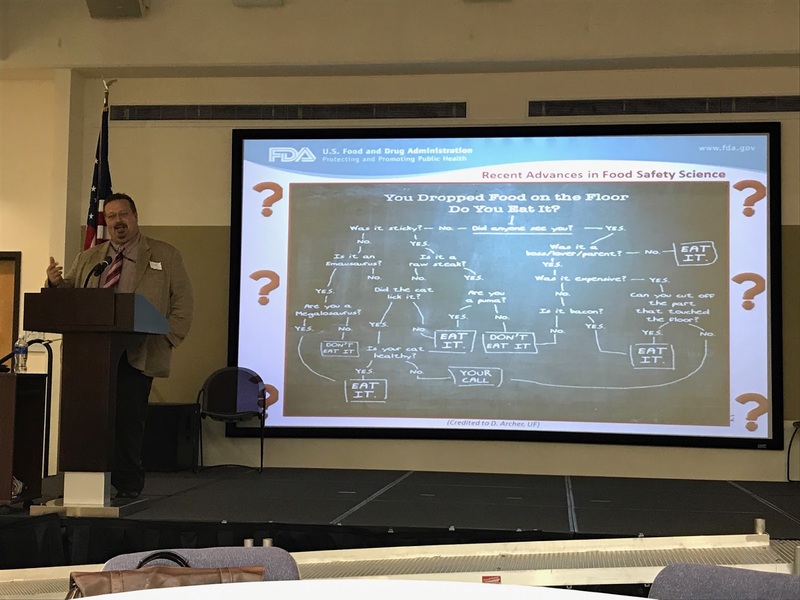 The day started off with a keynote speaker, Dr. Eric Brown, Ph.D. Dr. Brown is the director of the Division of Microbiology in the Office of Regulatory Science at the Food and Drug Administration (FDA). The topic of his presentation was “The Rise of Whole Genome Sequencing for Food Safety and its Role in Augmenting Traceback of Foodborne Pathogens Back to Their Source.” To put it simply, we learned about the advancements in technology that the FDA is using during foodborne illness outbreaks, such as salmonella, to determine the original source of the bacteria. 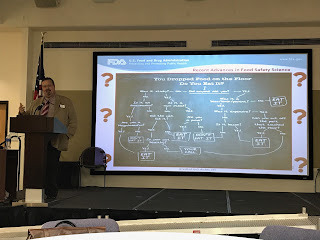 While the topic is serious, Dr. Brown was able to add an element of humor to this presentation by showing a decision tree for how people determine whether they will eat something they dropped on the ground. Points to be considered included “did anyone see,” “was the food sticky,” etc. After the keynote presentation and lunch, we presented our posters to four judges, all of whom are in the dietetics field. Posters were either in the “case study” category or “special project” category. We spent approximately ten minutes talking with each judge about our posters, explaining our topic, and answering questions. My abstract poster was about Recovery Record, an application (app) for eating disorder treatment. There are two different apps: one for the clinician and one for the client. The client can log food, feelings and behaviors in their app. The clinician uses the app to see a newsfeed of clients and their current moods, eating patterns, and behaviors. This app can be used for any kind of eating disorder and eliminates the need for a 24-hour food recall or counting on the client’s memory when determining what foods have been eaten recently. The client’s version differs from food trackers in that it does not include calories, macronutrients, or a food database. Food is entered in as free text and then the client is prompted to document if they ate too much food (binged), an adequate amount of food, or not enough (restricted). The clinician can easily see progress being made by the patient in a HIPAA compliant app, and can send messages back. The app allows for more frequent communication between the clinician and client between visits. This is important for those recovering from eating disorders. I believe the concept of this app, encouraging mindful and intuitive eating rather than calorie-based tracking, could be successfully used for apps for weight loss and other disease states. Me (left) and Angela (right) with our certificates of excellence for our abstract posters.